February and March this year are an exciting, festive, and rewarding time for the API Project of PFLAG NYC! 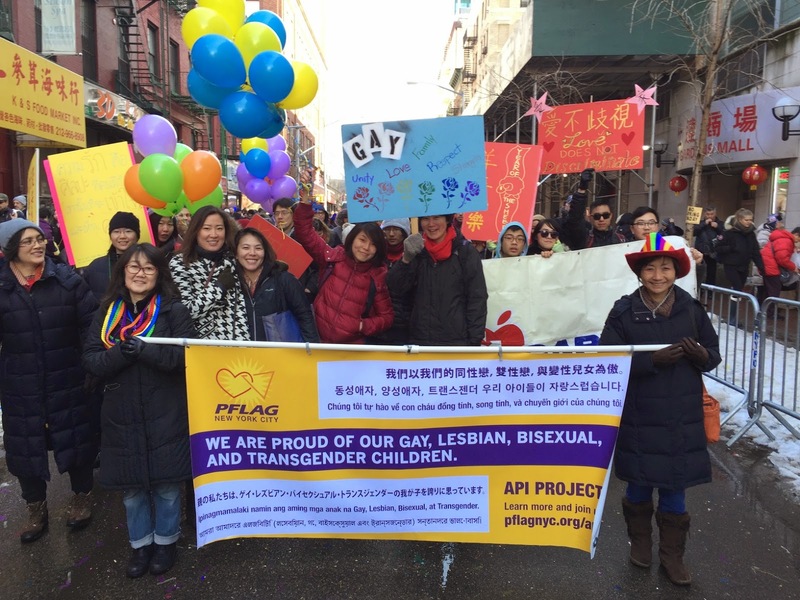 The API Project, founded three years ago, is PFLAG NYC's special support group and outreach/education project focused on helping families of Asian & Pacific Islander backgrounds learn to accept, support, and continue to love their LGBTQ kids. Led by a Korean-American mom, Clara Yoon, the group has come to include both families and LGBTQ individuals from diverse backgrounds from all over South, Southeast, and East Asia -- Pakistan, India & Bangladesh, Thailand, Vietnam & the Philippines, to China, Korea and Japan. Lunar New Year, celebrated in many Asian communities in January & February, has become as big an event on the annual calendar for the API Project as June's Pride celebrations are for PFLAG generally. 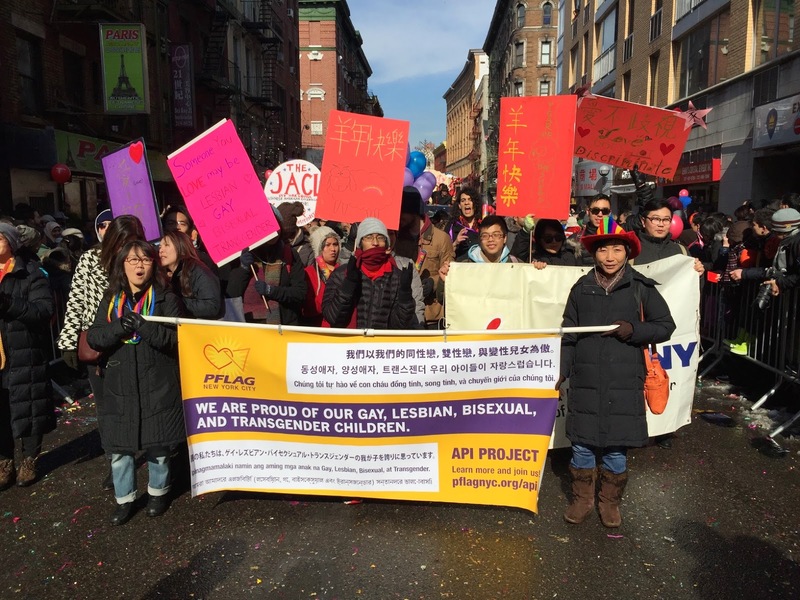 On Sunday, February 22, more than 20 supporters of the API Project and PFLAG NYC joined the Lunar New Year for All contingent in the annual Chinatown Lunar New Year Parade that wound its way down Mott Street, Canal Street, the Bowery and all the most historic parts of New York City's oldest Asian neighborhood. After marching, more than 100 people from Lunar New Year for All gathered at Project Reach, a youth center in Chinatown, to celebrate with a huge Chinese banquet. Speakers from Asian LGBTQ community organizations, including GAPIMNY, Q-Wave, and the Asian Pride Project talked about the origins of Lunar New Year for All. For many years, New York's Irish LGBT community has struggled to be included in the famous St. Patrick's Day Parade on Fifth Avenue. Still excluded from that event, the LGBTQ community has rallied around St. Pat's for All, an alternative parade held every year in Queens. In 2010, members of the Asian LGBTQ community were inspired to seek to be included in the Chinatown New Year's Parade. It didn't happen without struggle, but in the first year they tried, the group was allowed in under the Lunar New Year for All name. Ever since, the group has grown and become an important contingent in the parade. 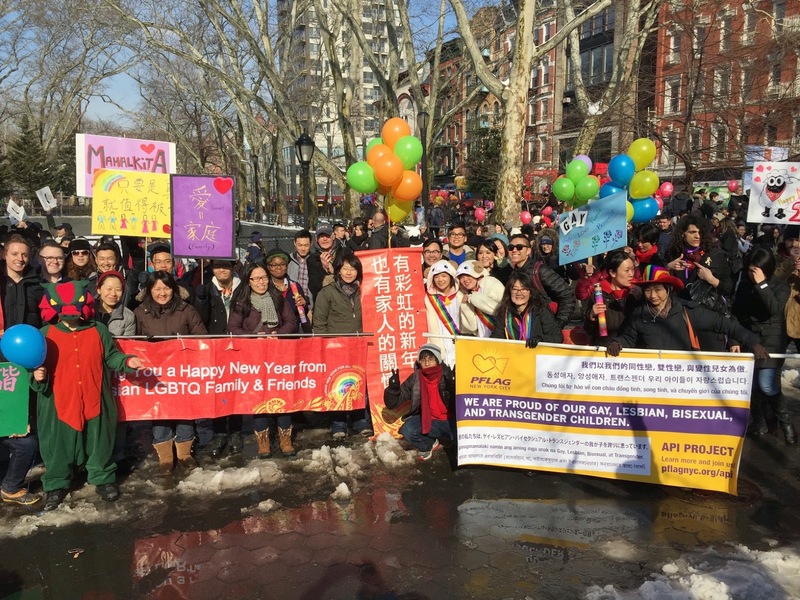 This year for the first time, the involvement of parents and PFLAG NYC's API Project was featured in an article in the U.S. edition of the large Hong Kong newspaper, the Sing Tao Daily. Parents proudly carried the API Projects new banner with PFLAG NYC's logo and the proclamation "We are proud of our gay, lesbian, bisexual, and transgender children" in English and six Asian languages: Chinese, Korean, Japanese, Bangla, Tagalog, and Vietnamese. 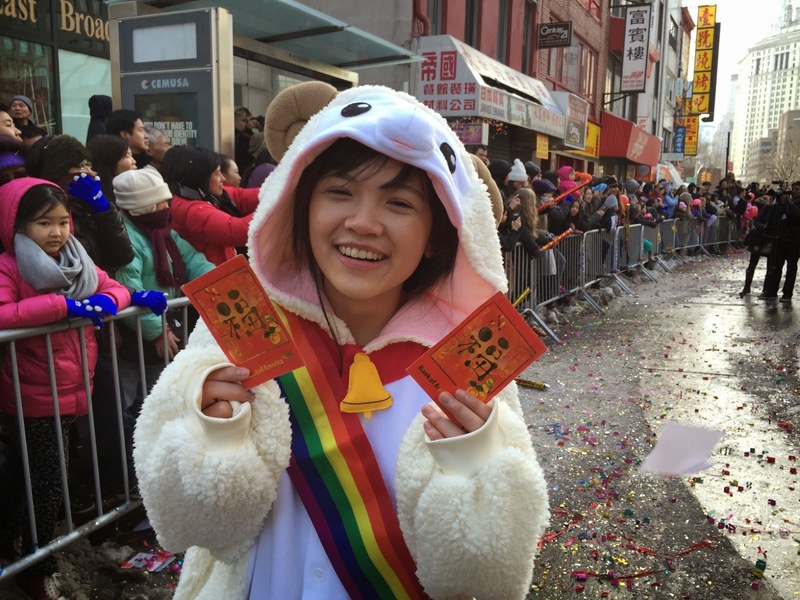 Of course it wouldn't have been a proper "Pride" march showing without a little fun: the Lunar New Year for All contingent was led by two rollicking "sheep" for the Year of the Ram, who were enthusiastic group members in adorable sheep onesies! This month, the API Project continues the excitement with word that we are to receive a big honor. Clara Yoon, the group's founder, will receive an NQAPIA Community Catalyst Award on March 28 and the annual awards banquet of the National Queer Asian Pacific Islander Alliance (NQAPIA). PFLAG NYC is immensely proud of Clara's being recognized in this way for her work to bring PFLAG's support to API families not only in NYC, but around the country through cooperation with other parents in the API LGBTQ community, like San Gabriel Valley API PFLAG. NQAPIA's Community Catalyst Awards Celebration will take place on March 28 at Grand Harmony Restaurant in New York City's Chinatown. Anyone interested in attending can get more info at NQAPIA's website, but should be sure to contact PFLAG NYC so all PFLAGers can sit together!